Strong dual-tension quality with special silicone pad. 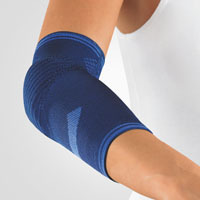 Extensive padding protects entire elbow area. The pad is flatter at olecranon with a raised profile at the edges.